Gen Con 2014 has yet to start and Harebrained Schemes has launched their much anticipated digitally-enhanced miniatures board game Golem Arcana. The game is now available at retail stores, and the accompanying free mobile app can be downloaded for Android smartphones and tablets from Google Play and for iPhone and iPads from the App Store. Five additional expansion sets are also available. Golem Arcana is a point-based army building game that blends the physical fun of tabletop gaming with the power of digital technology. It seamlessly connects a smartphone or tablet to the game’s figures, board, and cards via a Bluetooth-powered stylus designed specifically for tabletop gaming. Simply tap any of the game pieces with the stylus to send information to the app, or tap the board to make a move. The story for Golem Arcana begins after the meteoric rise and fall of the Great Khan. In the ensuing chaos, conquered tribes and clans rise up to reclaim their sovereignty, and neighboring empires mobilize to reclaim lost territory and honor, as the heirs of the Khan battle each other for control of the Gudanna Dominion. In Golem Arcana, players assemble armies looking for the best combination of attributes and special actions that will allow them to unleash havoc on the enemy. Each player fields an army consisting of Golems, Knights (sorcerers who “pilot” the Golems), Ancient Ones (powerful gods that might intervene on the army’s behalf) and Relics (powerful magical artifacts that can be carried and deployed by Golems). Depth of play and socialization. 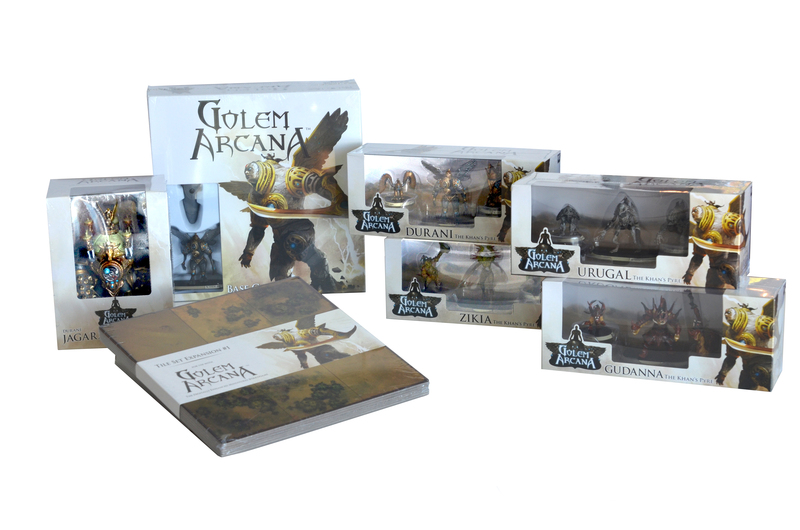 For a generation raised on video games more than board games, Golem Arcana brings the convenience they expect from video and mobile games to the tabletop. Easy to Learn and Accessible. No need to read or memorize complex rules – the app does all the math, but also shows players the breakdown. Fast Playing Time. Standard scenarios play in about thirty minutes, for larger games it’s under two hours. Gameplay Evolves in Real Time. The app regularly downloads new scenarios. Knights and Ancient Ones are digital playing pieces that are released regularly and can be purchased instantly. Organized Play (OP) Support. The app makes organizing and running events a snap. The app alerts players to in-store OP events in their area. Living World. Players control the fate of the world of Eretsu. The results of each game are automatically tallied and applied to the greater conflict. Major developments in the Golem Arcana story are triggered by the collective results of all the individual games. The Golem Arcana base set is priced at SRP $79.99 and includes six modular terrain tiles, a TDI (Tabletop Digital Interface) stylus, two ten-sided dice, two control cards, a quick-start instruction and lore book, and six pre-painted, large-scale Golem miniatures. The free mobile app comes pre-loaded with more than 80 digital characters, with many more soon to be available for sale. The Durani: The Khan’s Pyre Expansion includes the Jeweled Harpy, the Winged Preserver, the Fire Ram, three banner stands, three TDI Golem Cards, two double-sided Blessing and Curse tokens, four new Relic Cards, the Bulwark of Vajra, Daku’s Lens, the Peridot of Hantra and the Idol of Preyas. The Gudanna Terrors of the Steppes includes the Sand Lion, the Dune Viper, the Devil Djinn, three banner stands, three TDI Golem Cards, two double-sided Mana Well tokens, four new Relic Cards, Baylr’s Dagger, Zyama’s Censer, Santapa’s Ward and the Gauntlet of Ganna. The Urugal Keepers of the Pyre Expansion includes the Horned Blight, Plague Bringer, Carrion Raptor, three banner stands, three TDI Golem Cards, two double-sided Blessing and Curse tokens, four new Relic Cards, the Bone Scarab, the Lamp of Dusaka, the Bone Gate Totem and Zayla’s Cauldron. The Zikia Spirits of the Wildwood Expansion includes Bramblehorn, the Woodguard, the Wildwood Dryad, three banner stands, three TDI Golem Cards, two double-sided Mana Well tokens, four new Relic Cards, the Tendrils of Smera, the Tree of Life, the Rooted Road and the Cistern of T’Lo-Lu.